As ever, Will and Guy have a mixture. 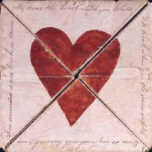 For Valentine's day we have jokes, funny pictures, strange but stories and even poems for romantics. 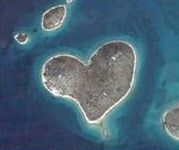 A tiny heart-shaped island in the Adriatic Sea has become a holiday hit for St Valentine's Day after being discovered on Google Earth. Even the uninhabited island's owner didn't realise how perfectly heart-shaped the island off the Croatian coast was until he was swamped with requests from lovers to stay there. 'Women with pasts interest men... they hope history will repeat itself.' Mae West. Q: Who sends a thousand valentine's cards signed, 'guess who'? But now dat I love u im scared 2 lose u. Can we come back tomorrow? A couple were having marital problems. They decided together to do the right thing and they contacted a marriage guidance counsellor. Several visits followed when lots of questions were asked and lots of listening carried out. Eventually the the counsellor felt that he had discovered the main problem. He stood up, went over to the women and asking her to stand up he gave her a huge cuddle. Britain's Roman Catholic Church is advising lovelorn singles to direct their 14 February requests for love to St Raphael, rather than St Valentine. Over the years St Valentine has come incorrectly to be associated with finding love, the Church says. He is the patron saint for those who have already found their soul mate. St Raphael is the patron saint for happy encounters and it is to him those fearing the Valentine's post should properly direct their prayers. He pined for her so much after they parted that he contacted the airline and begged bosses to ask her to get in touch. They obliged and Juliet, 29, phoned him and they agreed to go out to dinner. A whirlwind romance followed and they are to get married next month. Peter, who was in his early 20's, was buying an expensive bracelet, to surprise his girlfriend on Valentine's Day, at a very smart jeweller's shop in Hatton Garden, London.